Black Friday: Update Your Parents' Browser Day? Here's a family-friendly holiday idea from The Atlantic: Rather than shop on Black Friday, upgrade your technophobic parents' ancient Web browser. "Thanksgiving is coming up, that time when families gather together to share food, extend gratitude, and marvel at how Dad still uses Internet Explorer 6. No, seriously, Dad, how can you be using a browser developed during the Clinton administration? That was like 10 presidents ago." Microsoft loves the idea so much that it has assembled a "Top 10 Moments To Update Your Parents' Browser" list. Microsoft blogger Scott Armstrong writes: "All you need now is a good distraction, and this is something we can help with. The IE team put their pre-tryptophan heads together and came up with the Top-10 moments to update your parents’ browser this Thanksgiving holiday." "When they’re distracted by grilling you about when you’re going to get a real job, when you’re going to settle down, and when you’re going to give them grandchildren." If your folks' browser is up to date, well, you're in trouble. Head to the nearest doorbuster. Microsoft has tried for years to rid the world of its notorious Internet Explorer 6, a decade-old browser best known for its security holes. It even hosts a website, The Internet Explorer 6 Countdown, which chronicles IE6's very, very slow demise. "Friends don't let friends use Internet Explorer 6," Microsoft warns. Ouch. Harsh words for your own offspring. IE6 has survived this long for two reasons: Businesses use applications that run only on IE6, and a lot of users still run Windows XP--either because they don't want to upgrade, or because they're running a pirated version of the OS. 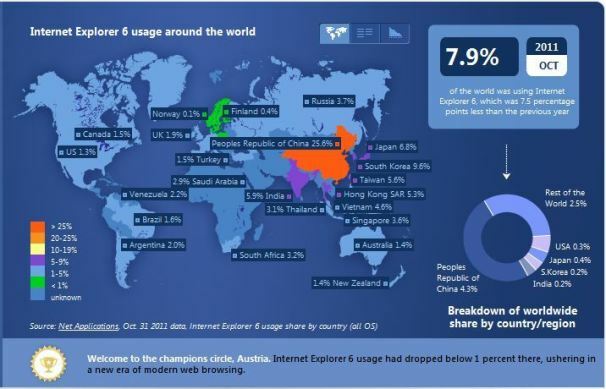 According to IE6 Countdown, nearly 8 percent of the world was using Internet Explorer 6 as of October 2011, a 7.5 percent drop from a year ago. Most of that usage is in China, where more than 25 percent of browsers still use IE6, says analytics firm Net Applications.